When will be Italy's Invisible Cities next episode air date? Is Italy's Invisible Cities renewed or cancelled? Where to countdown Italy's Invisible Cities air dates? Is Italy's Invisible Cities worth watching? Documentary series. Using the latest 3D scanning technology, Alexander Armstrong and Dr Michael Scott uncover 2500 years of hidden history in Naples from its earliest Greek and Roman origins. They explore how the volcano of Mount Vesuvius both nurtured the region and exacted a terrible price on the local population. Plus, they delve into a labyrinth of fascinating underground spaces that helped build and sustain the city. In episode two, Alexander and Michael take to the canals to discover the hidden secrets behind one of the world's most remarkable cities - Venice. Beginning their journey in Saint Mark's Square, Alexander and Michael take in the fusion of cultures in the buildings around them. They re-join the scanning team to hear how they will create a millimetre-accurate digital map of Venice, starting with Saint Mark's Cathedral (pictured). Using new technologies, the team will build an innovative and interactive snapshot of Venice that can be used to help monitor and conserve this crumbling city. To complete the picture, Michael dives into Venice's notoriously dirty canals to find out how the city remains standing despite its watery foundations. Exposing load-bearing wooden piles preserved in mud, Michael explains the ever-present danger to the city's stability from the boats and rising waters. Venice's numerous bridges connect busy streets and piazzas. Michael and Alexander visit the famous Rialto Bridge to see how this magnificent piece of architecture hides engineering genius in its foundations. The scanning team is on hand to reveal the secrets in detail. Using 3D scans to uncover hidden jewels in the Jewish Ghetto and the endless passageways inside the Doge's Palace, Michael and Alexander finish their visit with an exploration of the history of Venetian sin and pleasure. Writer Tony Perrottet gives Alexander a tour of one of Venice's historic gambling houses, frequented by cliental such as Casanova. Casanova knew the dark side of this city first hand. Michael and Alexander visit a hidden network of rooms in Doge's Palace, including the torture chamber where Casanova was interrogated. With the help of 3D recreations of the Doge's Palace, Casanova's escape route is re-traced in virtual reality. 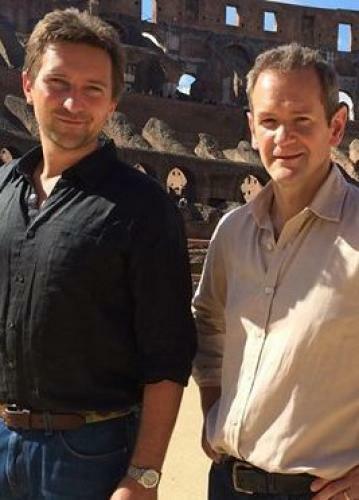 Using new 3D technology, Alexander Armstrong and Dr Michael Scott explore the hidden side of romantic Florence and uncover the birthplace of the Italian renaissance, historic home to the all-powerful Medici family. With the help of historian Ross King and the scanning team, Alexander discovers the hidden secrets of Florence's cathedral. They learn that the great brick dome is comprised of two domes - an outer and inner shell bound together with rings of sandstone. The secrets of this piece of architectural genius are brought to life with stunning 3D scans. Michael and Alexander next explore the Medici's fraught relationship with one of their employees, none other than Michelangelo. Michelangelo was like a member of the family and designed the Medici's mausoleum. But then he fell from favour when he supported a rebellion against his own masters. In 1975, it was discovered that Michelangelo chose an unlikely place to hide from the Medici's – a secret chamber below the mausoleum he'd created for them. Alexander and Michael use 3D models to recreate this sanctuary and to trace Michelangeo's secret escape route to a safe house nearby. Alexander and Michael complete their Tuscan exploration with a visit to the world-famous Uffizi - including the Botticelli room. Michael takes Alexander along the Medici's private corridor running more than a kilometre through the city from the Uffizi to the Medici's stately residence on the south of the river. Again, utilising the cutting-edge technology, this secret space is recreated as an astonishing virtual reality experience revealing Florence as it's never been seen before. Italy's Invisible Cities next episode air date provides TVMaze for you. EpisoDate.com is your TV show guide to Countdown Italy's Invisible Cities Episode Air Dates and to stay in touch with Italy's Invisible Cities next episode Air Date and your others favorite TV Shows. Add the shows you like to a "Watchlist" and let the site take it from there.